You are in the Lair of the Possessed Otyugh. You are standing in the rubble of a partially collapsed tunnel. Ahead of you is a door. You pry open the jammed door and... Enter the Preparation Room. The room is lit by guttering tallow lanterns. Tables covered in jars line the room. A slab for embalming bodies rests in the center of the room. A corridor leaves ahead of you and another entrance on your left leads to a small room. 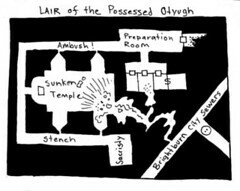 Secret of the Old City by Simon Bull One Page Dungeon. I remember that one! I liked it. Always a fan of any adventure that uses an Otyugh.